It’s different this time because more people are adding their voices and visuals to the conversation. It's easy to find dangerous examples. In my life, I’ve never experienced the simple, mundane danger of crossing the street as acutely as I have so far this summer. I come within arms length of a moving car every day while crossing from one sidewalk to another. When the pedestrian signal switches to 'walk', I watch people, alarmed and surprised, step back to the curb as another car uses the threat of vehicular homicide to barge through a left turn, the yellow light long since changed to red. The symptoms of this deadly environment are obvious to anyone and everyone who stops to look at the mess. Intersections are blocked with cars at all hours by drivers ignoring simple laws. As Gil Meslin demonstrated this week, red lights are routinely ignored (In a school zone! With children nearby!) for the sake of saving the wait of a one minute traffic cycle. Based on one Twitter user's observations, it seems to be police policy that cars be given priority to move through intersections after they've broken the law to proceed into them. The second car goes through a red. Screenshot from Gil Meslin's video. Click for tweet. 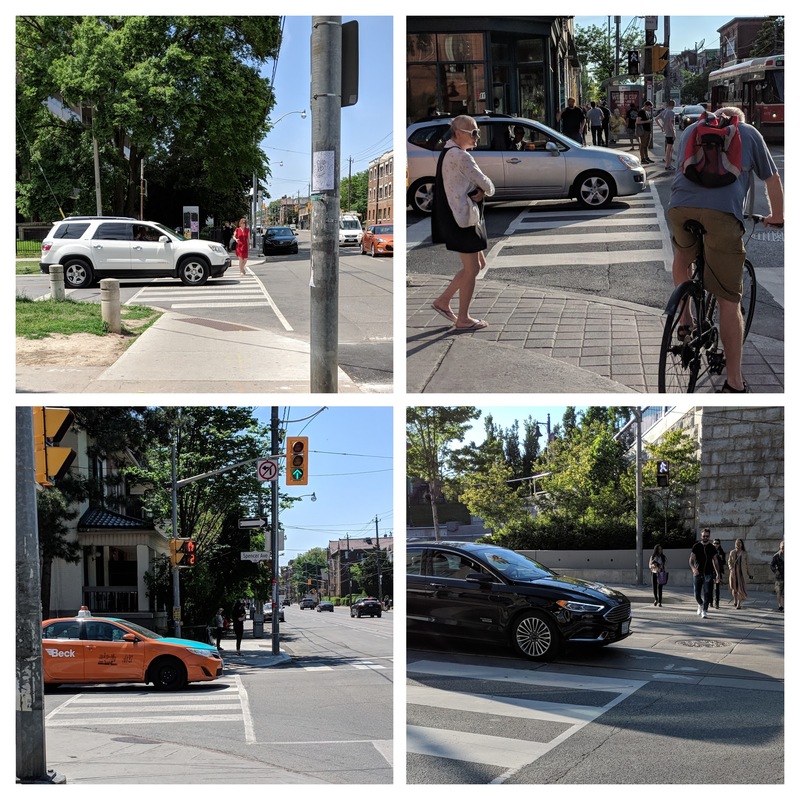 Over a couple days earlier this month I documented the simple act of failing to stop at stop lines, and how this pushes pedestrians closer to passing cars. We all want traffic to move, and get people to work or home to their families, but when will enough be enough? Luckily, the conversation around safe streets for pedestrians and cyclists in Toronto seems different this time. Vision Zero put a goal ahead of Mayor John Tory city council to end pedestrian and cyclist deaths. As the body count rises and months-old council votes resurface, it becomes plainly clear how low a priority Vision Zero is for city government. It’s no surprise then that leaders from the civic sphere like Toronto’s former Chief Planner Jennifer Keesmaat are calling on the special powers of a state of emergency end this deadly trend. University Of Toronto urban specialist Richard Florida has also brought some disturbing statistics to light in hopes of moving city officials to action. Today, more Torontonians die from being hit by cars than from being killed by guns. In 2016, nearly 2,000 pedestrians and 1,000 cyclists in the city were hit by cars. It’s different this time because more people are adding their voices and visuals to the conversation. Cars are so blatantly ignoring laws that it's easy to find dangerous examples. Anyone who sees two or three cars move through a red with impunity can't help but be alarmed. What is the solution? A coalition of organizations are calling for 15 actions to improve the safety of city streets. As many people pointed out while debating the Vision Zero tech competition, the solutions are cheap and physically simple to implement: More sidewalks, more traffic-calming street design, lower speed limits, more red light cameras. 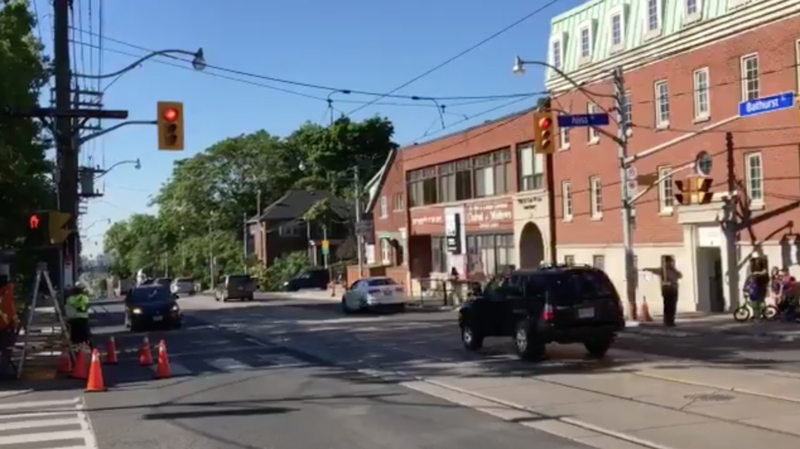 Even at a modest cost relative to other cities, Toronto simply can’t summon the political will to put people’s lives ahead of expedient car travel with bike lanes and additional traffic-calming measures on streets. Unlike the King Street pilot, which might play on an urban/suburban tension about the value of public transit, these deaths happen across the city - from the suburban arteries to the separated bike lanes of crowded downtown streets. It's mystifying that city council won't take greater action before the election later this summer. Personally, I would like to see city council direct police to enforce the laws that are meant to keep people safe when they’re walking on the street. I would like to see more police officers stopping cars after they run red lights and after they threaten pedestrians’ safety with their vehicles. Like Keesmaat wrote in her article, every one of these deaths is so tragically mundane. These people are following the rules, and trusting the rules to keep them safe. It’s just a person trying to run their errands, get to work, see a friend across town. So preventable, so tragic and so sadly normal.